Our world had just been turned upside down………..
We had just been told that our son Liam (6) had leukaemia and we were flown to Brisbane (from Mackay) within 24 hours! The world doesn’t stop when a diagnosis is given, if anything it gets more difficult. How will our other children handle the news (22, 20 & 3)? How will we earn money to survive? and many more are thrown on top of………Will our Son survive??!! Within a week, we were placed into an amazing 3 bedroom unit at the Leukaemia Foundation Village in Cooper Plains. It was ours for as long as we needed it, no cost to us at all. There was amazing support in the office from all the ladies, vehicles if we needed, their own bus service to the Hospitals and financial aid also. To not have to worry about accommodation was such a relief. To learn of all the other services available to us was overwhelming, and having our hands held in times of stress by the onsite counselors was such a blessing. There were other families staying in the village who were going through similar journeys as us. It was great to make those connections and have people surrounding us who understood what we were going through, and who we could be there for too. We are so very grateful to the Leukaemia Foundation for having these resources in place for all the families that unfortunately find themselves in need of their services. We are proud to be able to help raise the funds by volunteering at all the events (World’s Greatest Shave, Light the Night and the BMA Mackay Marina Run) to help the Foundation continue to support the many families in need. Join the Cottons at this year’s Mackay Marina Run as they run to support locals like them impacted by blood cancer. Go to the Fundraising page and set up your online Leukaemia Foundation fundraising page now to help beat blood cancer. 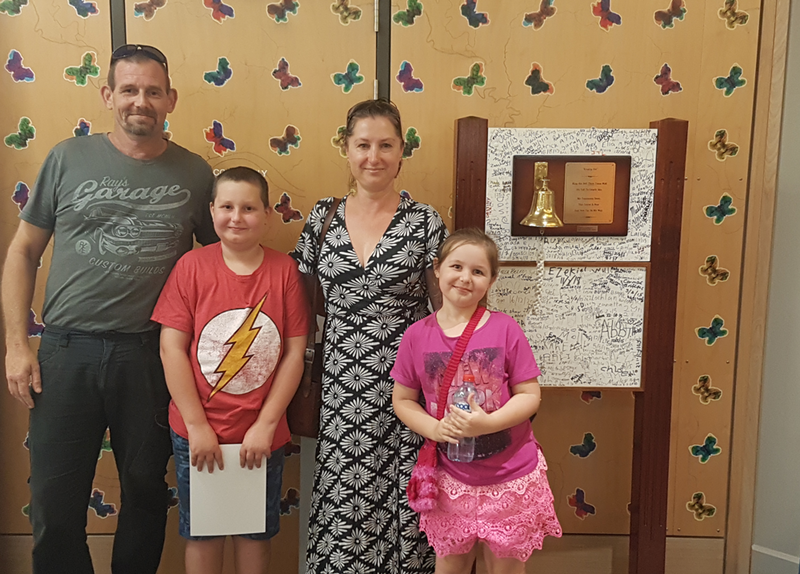 Lindsay, Liam, Kris and Alexis Cotton are pictured at Liam’s bell ringing at the Mackay Base Hospital in February 2018. The Leukaemia Foundation the only national charity dedicated to improving the lives of patients with all types of blood cancers including leukaemia, lymphoma and myeloma. We want more people to survive a blood cancer diagnosis and go on to live a full life. We are committed to investing in research projects which focus on improving patient outcomes and providing free support programs which aim to reduce the emotional impact of a blood cancer diagnosis. For more information please visit www.leukaemia.org.au or visit Facebook, Twitter or Youtube. When Mackay local and father of four, Mark Rainsford, takes part in this year’s Mackay Marina Run, it will signify a celebration of his survivorship and a milestone in his recovery from blood cancer. Mark had been feeling very lethargic and unwell for a number of months. As someone who enjoyed regular exercise, this was out of the ordinary. Night sweats and huge weight loss saw him checking into hospital for tests. “I was so weak…I was skin and bone”. Mark faced three months of chemo in Townsville to treat non-Hodgkin lymphoma, a type of blood cancer. The relocation from Mackay to Townsville meant Mark faced the immediate challenge of finding a place to stay. That’s where the Leukaemia Foundation stepped in, finding Mark a comfortable place to stay free of charge while he underwent the fight for his life. Six months after he returned home from the transplant, Mark was playing soccer again, something doctors thought he wouldn’t be doing so quickly after treatment. Building up his fitness was once again very important to him. “Even after a chemo session, I’d be looking forward to getting on my skateboard or bike. Other patients thought I was joking”. 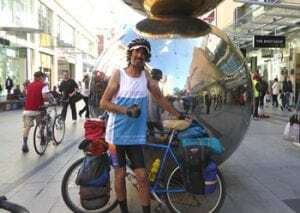 Last year Mark cycled across the Nullarbor solo, fundraising and raising awareness of the Foundation. Mark is now training in preparation for the Mackay Twilight Run this month, which is the lead-up event to the Mackay Marina Run in June. Mark is the official Leukaemia Foundation ambassador for these events.